Hauser Estate Winery was established in 2008 as an alternative agri-tourism venture. It’s located in the historic area of Gettysburg, Pennsylvania – an area previously known for its fertile farmland and acres of Pennsylvania’s apples. The late John “Jack” Hauser planted his first orchards in the 1950s. However, with the increasing international competition, the family took the bold new step to diversify and uproot some of their orchards for vineyards. From the beginning, they deployed a “green” strategy in their operations. The cellar was built underground with a green roof overtop in an effort to be as energy efficient as possible, but to also maintain a consistent temperature year round. Solar hot water heating system – the water is mainly used for cleaning their tanks and equipment. Heat exchange system – only uses hot water heated by the sun, not hot water heated by electricity. The final green aspect is with their cider and their transition to cans. 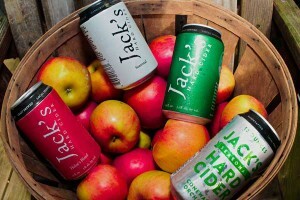 Starting a few weeks ago their Jack’s Hard Cider moved to cans. Cans are greener than glass – period. They are lighter and therefore their carbon footprint both in storage and transportation is far less than glass, and they require much less energy to recycle. The can and the canning technology allow us to get the product into a container with less oxygen pickup and then once in the can it is protected against both light and air, to a greater degree than in bottle.” states Jonathan Patrono, owner. The cans and lids require a thicker interior coating to deal with the acidity of the cider. However, that did not add to their cost and required no adjustments to our automated canning system. Through distributors, Jack’s Hard Cider is available in Pennsylvania, Maryland, Georgia and is continuing to expand nation-wide. Cider is a small but growing segment in the US. In 2011 the overall cider segment grew by 26% in volume.